The Marlington Local School District recently received the Purple Star Award from the Ohio Department of Education. 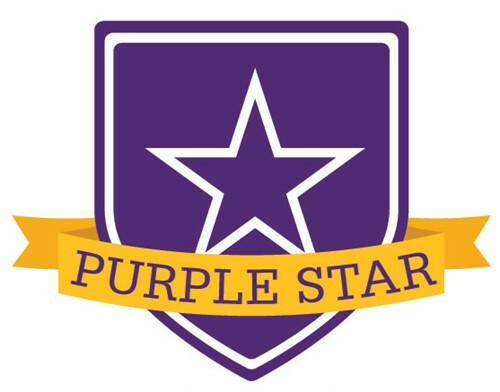 The Purple Star Award recognizes schools that are supportive of the community’s veterans and military families. To receive the award, schools must have a staff point of contact for military students and families who serves as the primary liaison between them and the school. Mr. Steve Miller fills this role for Marlington. Additionally, the district must have a dedicated page on its website featuring resources for military families, which can be found at www.marlingtonlocal.org/MilitarySupport.aspx. The school district recognizes local veterans in a variety of ways throughout the school year. Each Veterans Day, Marlington High School hosts a Veterans Day celebration that includes a presentation of the colors by the Marlboro volunteers, performances by the band and choir and guest speakers to honor the veterans in attendance. In December, the district held its first Military Night to recognize Gold Star Families. The event, which took place during a varsity basketball game against West Branch, took time to recognize both Marlington and West Branch Gold Star families with a special presentation. The families were also invited to a dinner before the game. All military personnel were admitted to the game free of charge, and students and the community were encouraged to dress in camouflage to show their support.